Big kids are ready for big things…like our ukulele drop-off camp and the musical adventure of a lifetime: A Campfire Ukulele class! Classes include ukulele instruction, music & movement, center time, crafts, and a performance at the end of the week! Classes include ukulele instruction, crafts, and a performance at the end of the week! Our summer classes are held in June in KCMO and July in Lenexa. 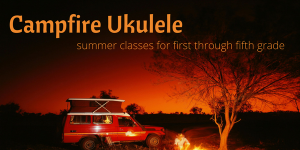 Campfire Ukulele class tuition is a one-time, non-refundable fee, paid at the time of enrollment. Tuition includes four daily classes, supplemental materials, and a ukulele to keep! Already have a ukulele? Contact us at the time of enrollment for a $40 tuition discount. Refer a friend and save! You’ll receive $10 off your next tuition payment when a new-to-us family enrolls.